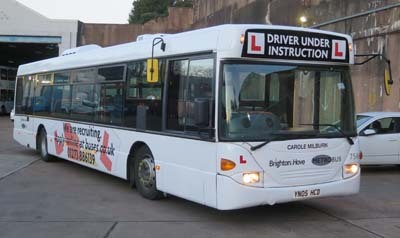 Connections with Brighton and Hove : Maria Andrews career in the transport industry began in November 1999, when she became a bus operator working for Metrobus at the Orpington depot. Although It took her two attempts to pass her driving test, It was a job she settled into and enjoyed. By 2008 Maria had joined the training school based in Orpington, then in 2011 the school was relocated to Crawley. Maria had found her vocation. Being a member of the training team and the different aspects the role offered, suited Maria and she relished the challenge that each day held. 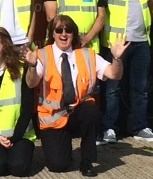 But the role that gave her the most sense of achievement was being out and about on the training bus, Teaching the new trainees the tricks of the trade. Maria's time as an instructor gave her so much job satisfaction, each and every pass filled her with joy. 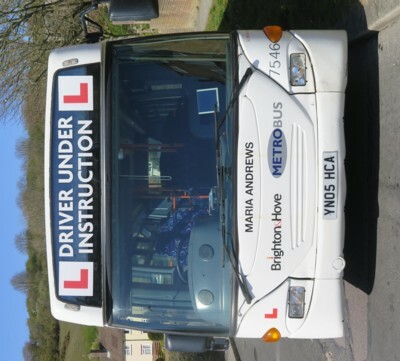 Because of Maria's efforts and dedication, There are now bus drivers covering an area from Orpington to Brighton, who have been trained by her. Some needed more help than others, but they all know that Maria never gave up on any of them. In January 2016 Maria took up the opportunity to work on secondment with the Go-Ahead group in Singapore. It was here that she sadly passed away. Maria Andrews was a very popular, kind hearted individual who prided herself on always trying her best, she was always willing to give a helping hand when she could. 7546 Scania Omnicity - carried name since December 2017 on a training bus.